Uganda’s Stephen Kiprotich has cemented his status in the marathon history elite and cemented his legacy, backing up his Olympic gold medal from London last year and overcoming a strong Ethiopian contingent to win the 2013 Marathon World Championship in Moscow. Kiprotich ran out the race in 2:09:51, relatively pedestrian compared to the times seem at the World Marathon Majors, however while Kiprotich may never be the fastest marathoner in the world, in being only the second marathon runner to complete the Olympic/World Championship double, he has certainly earned the credentials as the premier tactical and championship racer. The Ugandan was followed home by a trio of Ethiopians, Lelisa Desisa in 2:10:12, Tadese Tola in 2:10:23 and London Marathon winner Tsegay Kebede in 2:10:47. Conditions were much more pleasant for the men than the women’s field faced a week ago, but again it was the 40 kilometre mark that proved the turning point of the race, first with Kiprotich and Desisa dropping Tola, and then Kiprotich found an extra gear to kick clear. He entered Luzhniki Stadium 100 metres ahead of Desisa and was never challenged. On paper Kiprotich never seemed a real threat to repeat his Olympic success, having only the 14th fastest personal best out of the starters, his a full three minutes slower than most of the Ethiopians. As the Olympic and World Championships prove though, racing on a national team, without pace-setters and chasing a medal is a very different type of run to a major city marathon. With an Olympic Gold and World Champion title around his neck, Kiprotich is the current generation’s unquestionable big race champion. 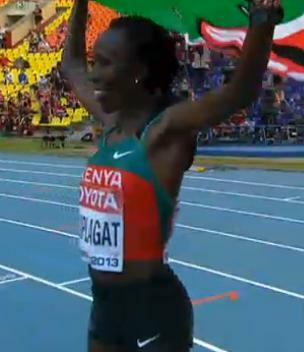 So Edna Kiplagat made history, retained her title, restored some Kenyan dominance and won the 2013 Women’s World Championship. But what were the other stories of the race? Of 72 listed starters, 70 toed the line. The controversial 2pm local time start of the race, in the heat of the day with temperatures of 27C/81F as the gun went off, was always going to be factor and it undoubtedly was – only 46 of the 70 (65%) crossed the finished line. Admittedly this is not uncommon amongst professionals, who will often drop out and save themselves for another day but it is still worth noting. One thing that did become clear from this race was that women’s marathoning truly is a global sport and less prone to the African dominance seen in men’s racing. There were only two countries to have two runners in the top 10; Japan in third and fourth, and Italy in second and sixth. The top 20 placegetters had representatives from 13 countries with the most dominant country in that list been North Korea, with three. To put that in perspective, there were more finishers from North Korea in the top 20 than from all of Africa! Great Britain’s Susan Partridge was one who used the heat to her advantage, saying “I started off and I was way back and for a minute I did wonder if I had been a little bit too cautious. It was just getting my rhythm going and I didn’t really think about the times or even paying attention to the kilometre markers. It was all about looking at the next person in front of me and trying to get past them and it was a proper race in that sense.” She went through halfway in 22nd but finished strong to cross the line in ninth. Compatriot Sonia Samuels finished in 16th. The full results can be viewed at the IAAF website. 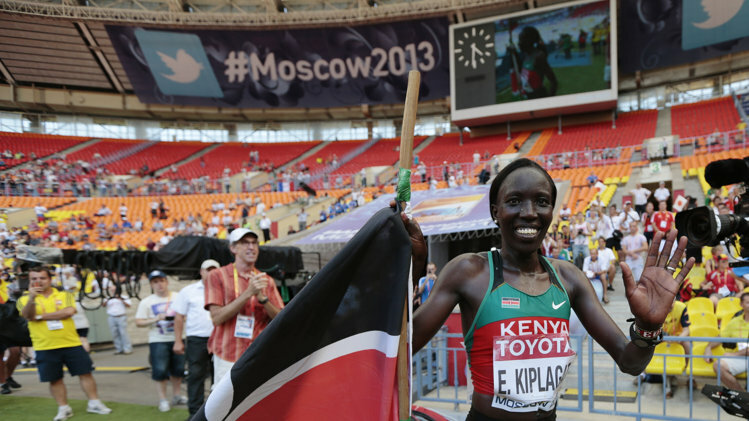 Despite a far from ideal preparation and travel to Moscow, Kenya has claimed some redemption from last years Olympics, with defending champion Edna Kiplagat becoming the first woman to retain her title. On a hot and humid day, Kiplagat crossed the line in 2:25:44, kicking clear for the win at the 40km mark from Italy’s Valerio Straneo. Straneo had set the pace all day but couldn’t overcome Kiplagat’s spurt and settled for second 10 seconds later. It was the best performance by an Italian in a World Championship marathon. Japan’s Kayoko Fukushi claimed third in 2:27:44. The highly fancied Ethiopian team failed dismally, with no runners in the top 10. 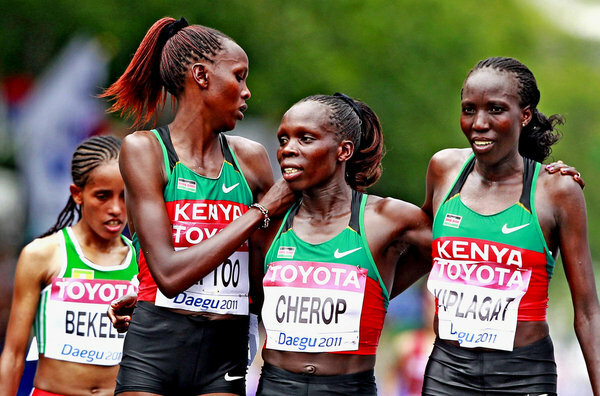 There will be no Kenyan trifecta in the 2013 Women’s marathon. Tomorrow will see the start of the 2013 IAAF World Championships, when the eyes of the athletics world will descend upon Moscow. One of two medal events on the first day is the Women’s marathon, and most punters would expect Kenya to be challenging for the medals after their podium clean sweep at Daegu in 2011. Before the starters gun has gone off we can say with certainty that there will be no Kenyan clean sweep this year. Such a claim is not a prediction on form or a preference for runners from rival Ethiopia (although they will certainly be a factor) but rather it is a sad statement of fact with news that Kenya has right royally stuffed up the logistics of getting to Moscow, meaning two of their four competitors will toe the line. The Kenyan Daily Nation reported that defending champion Edna Kiplagat and Lucy Kabuu will be the only two starters after Team Kenya’s flight to Moscow on Monday afternoon was cancelled due to lack of jet fuel and bizarre decisions saw half the squad not make the onward flight to Russia. Valentine Kipketer was left behind when the team left on Tuesday morning, while Margaret Akai was secretly axed from the team owing to an injury. Kipketer was left stranded, with no official from Athletics Kenya to sort out her travel issues as most of them had travelled to Moscow. Kipketer, winner of the 2013 Mumbai Marathon in 2hrs, 24:20min, was left asleep at the Laico Regency Hotel when the team departed on Tuesday morning and was hoping to catch a flight to Moscow on Wednesday night. However, the fire at the Jomo Kenyatta International Airport Wednesday morning left her stranded after all the incoming and outgoing flights were cancelled. 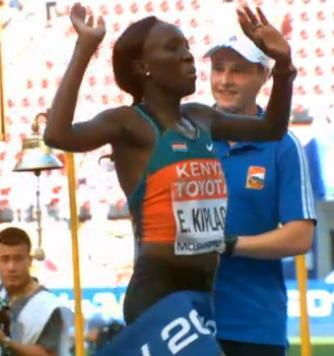 Kipketer was eagerly awaiting communication from Emirate Airlines regarding her next flight. The path to redemption just got that bit harder for the Kenyan powerhouse. UPDATE: KIPKETER DID EVENTUALLY GET TO MOSCOW AND TOED THE STARTING LINE. The Kenyan men’s team is set to fly to Moscow next Tuesday. In a completely hypothetical and largely pointless exercise, Marathon Intervals compiled the start list of the 2013 Men’s Marathon World Championship to be held in Moscow on August 17. Now while we know there is never going to be a race where everyone runs a PB, not to mention the impact that race tactics have on a major race such as the World Championships, we thought it would be fun to see where everyone would finish on their recorded best time. The results are about as predictable as you would. Ethiopian runners hold the five fastest times by personal best, led by 2013 Virgin London Marathon winner Tsegay Kebede (2:04:38). The first non-Ethiopian runner is Kenya’s Bernard Koech in 2:04:53. Of the top 12 runners, only three countries are represented; Ethiopia (6), Kenya (5) and Morocco with Jaouad Gharib in 2:05:27. 2012 Olympic gold medalist Stephen Kiprotich slots into 14th fastest with his 2:07:20. Eritrea has three runners in the top 20 while Japan has all five of their representatives in the top 25. The field consists of six runners who have gone under 2:05, a further three under 2:06, four under 2:07 and six runners who have run 2:08 flat or under. The slowest runner in the field by PB is Guatemala’s Jermias Saloj who has a best time of 2:16:56. Of the 77 runners toeing the line at this stage, only 29 have gone under the 2:10. If you take out the strong Ethiopian contingent there is definitely a noticeable absence of some of the worlds best. We’re one week out from the opening of the 2013 IAAF World Championships and the eyes of the athletics world are set to descend upon Moscow. We’ll begin with one thing we know – the course. The route will start and finish in the centrepiece of the championships, the Luzhniki Stadium, with the first 600m and final 300m run on the track at the stadium. The distance in between is run through central Moscow, along the banks of the Moskva River. It is essentially four laps from Luzhniki Stadium up to the Kremlin and back, although the first lap is shorter with a turn at 6.25km while the other three laps are 10km each (5km each way). A course map is pictured below. 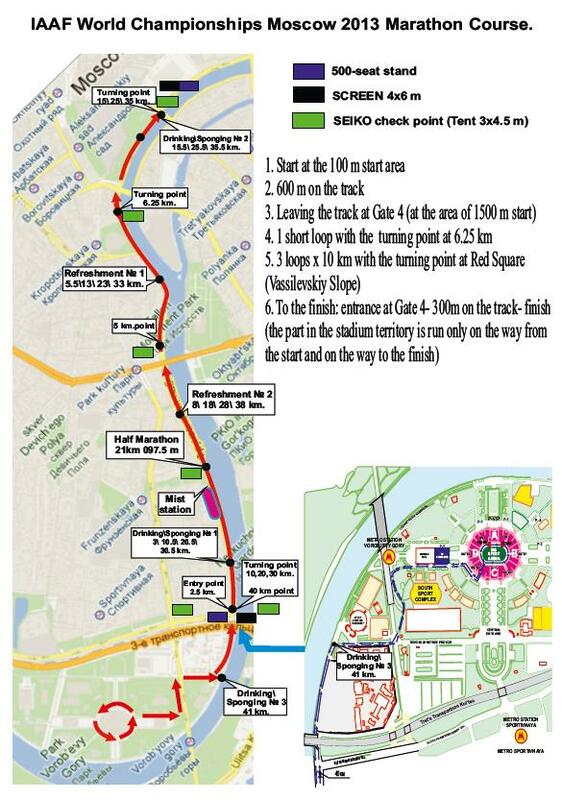 The 2013 World Championship marathon course. While that may sound picturesque, the course has received some criticism with former Kenyan Olympian Kipchoge Keino describing the course to marathon commentator Toni Reavis as ‘a glorified time trial’. Keino goes on to say a ‘5K up and down the Moscow River six times, and this is the best you can do for the sport? There are no real hills or turns to use to try to escape the competition. 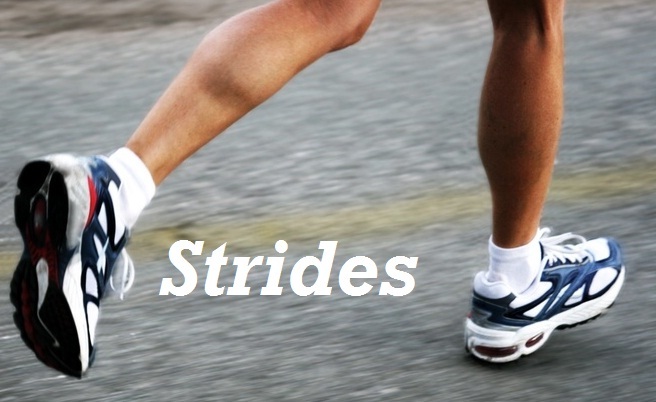 They just compress 42 kilometers into a four mile area so they can pack the crowds and make them look big’. The timing of the event has also raised eyebrows, with the women’s marathon starting at 2pm local time and the men’s event at 3.30pm. The current long range forecast has the temperature for the two races sitting at 31C/88F and 30C/86F. By starting at this time it is likely the races will be at the hottest parts of the day. This is certainly going to take a toll on the runners. It has been speculated that the reason for the time is to satisfy the Japanese TV rights holders whose sole interest in the event is the two marathon races. In terms of actual athletes who are running, there are a number of big names missing in both events. Although we are still awaiting a complete list of entrants for the two events, the short priced men’s favourite in my eyes would have to be a battle out of Olympic gold medalist Stephen Kiprotich and London 2013 winner, Ethiopia’s Tsegaye Kebede (2:04:38), however Ethiopia has three other runners also with PB’s under 2:05. The Kenyans are led by Bernard Koech (2:04:53) who has run the fastest half-marathon in the world this year, and teamed up with Michael Kipyego, Bernard Kipyego, Nichola Kipkemboi, and my favourite of the Kenyans, Paris Marathon winner Peter Some. 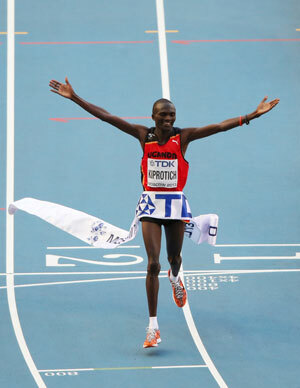 The Kenyans have stated that they will need to run as a team and have a very tactical race if they are to challenge the Ethipioans and retain the title won by Abel Kirui in 2011. On the women’s side it is again the Ethiopians that look strongest, led by Boston marathon winner Lelisa Desisa, although defending champion, Kenyan Edna Kiplagat is racing and will be in the mix to defend her title. Given the headline news major marathons have had lately with Boston and New York, I think we all just want the racing to start and let a new legend of the sport emerge. Who is your pick for the word titles?